While only a fraction of our public lands are affected by illegal marijuana cultivation, the Pacific Crest Trail Association, U.S. Forest Service and our other agency partners believe that safety risks are real and everyone should be informed about them. On U.S. Forest Service land in California alone, more than 400 illegal grow sites have been identified. 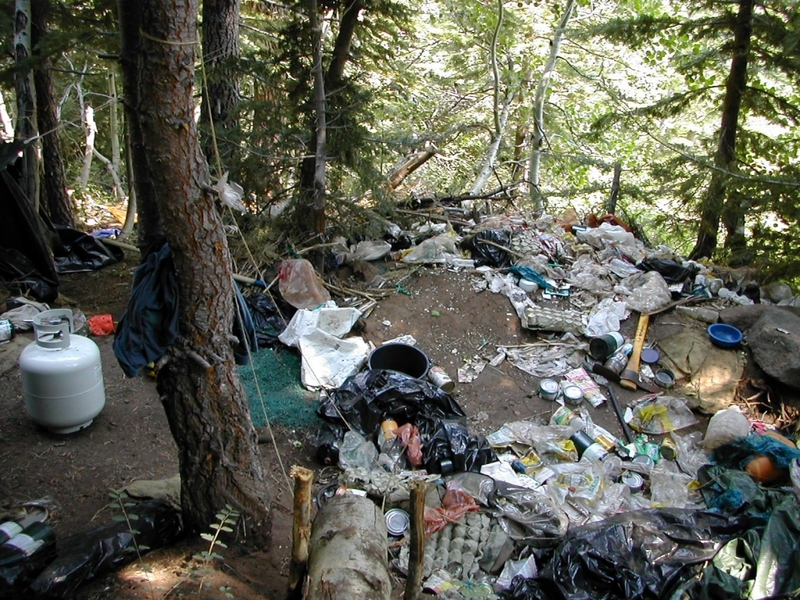 International drug organizations have traditionally set up illegal grow sites on national forests in California. Dangerous people protecting marijuana cultivation sites may be present on the Pacific Crest Trail corridor. Hikers and equestrians should be aware that armed individuals may violently protect their grow sites. The safety of Pacific Crest Trail visitors, volunteers and employees is our top priority. Marijuana cultivation occurs on some public land and it’s important for everyone to be aware of their surroundings. The disturbances that marijuana cultivation makes on natural resources causes extensive and long-term damage to ecosystems and impacts the supplies of public drinking water for hundreds of miles. Growers clear native vegetation before planting and sometimes use miles of black plastic tubing to transport large volumes of water from creeks that are often dammed for irrigation. The use of banned herbicides and pesticides by marijuana growers kill wildlife and competing vegetation. This loss of vegetation allows rainwater to erode the soil and wash poisons, human waste, and trash from the grow sites into streams and rivers. Sometimes marijuana smells like a skunk on hot days. Grow sites are usually found in isolated locations, in rough steep terrain. Camps containing cooking and sleeping areas with food, fertilizer, weapons, garbage, rat poison, and/or dead animals. Small propane bottles, which are used to avoid the detection of wood smoke. As soon as you become aware that you have come upon a cultivation site, back out immediately. Never engage the growers as these are extremely dangerous people. If you can identify a landmark, PCT mile point, or record a GPS coordinate, that’s very helpful. The growers may be present and may or may not know that you have found their grow site. Get to a safe place and report as much detail about the location and incident as you can recall to any uniformed land agency employee or to the local law enforcement agency. Please also notify the PCTA. Leave the way you came in, and make as little noise as possible. Visitors should be aware that marijuana use remains illegal on federal lands. Click here to download an informational poster about identifying illegal cultivation sites. 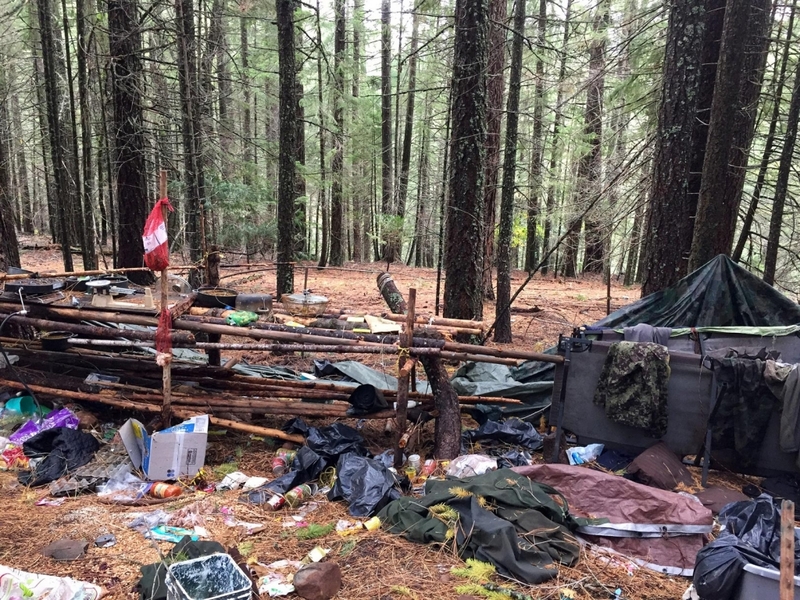 Forest Service personnel, joined by representatives of six federal and civilian partners, cleaned more than 6,000 lbs of trash and 7,000 lbs of irrigation pipes from an illegal marijuana cultivation site on the Lassen National Forest, Oct. 17-20, 2016. The site contained three large camps, numerous dumping locations and more than 1,250 lbs of fertilizer and pesticides. The cultivation operation was growing between 16,000 and 20,000 plants near the Pacific Crest Trail along Screwdriver Creek, a tributary of the Pit River which drains into the Shasta Lake Reservoir and the Sacramento River. Water diversion and contamination by pesticides from the site have adversely effected Screwdriver Creek. The Screwdriver Creek clean-up was part of a two-week operation, spearheaded by the Lassen National Forest, involving multiple grow sites. If the work being done were to be contracted, the cost would likely exceed $1 million. By managing the reclamation itself and enlisting help from partners, the Forest Service anticipated the cost to be closer to $250,000.